For our second instalment on Ireland's castles, we delve into ancient lakeside piles and the favourite haunts of ghosts and starlets alike. Click here to read part one of this series! 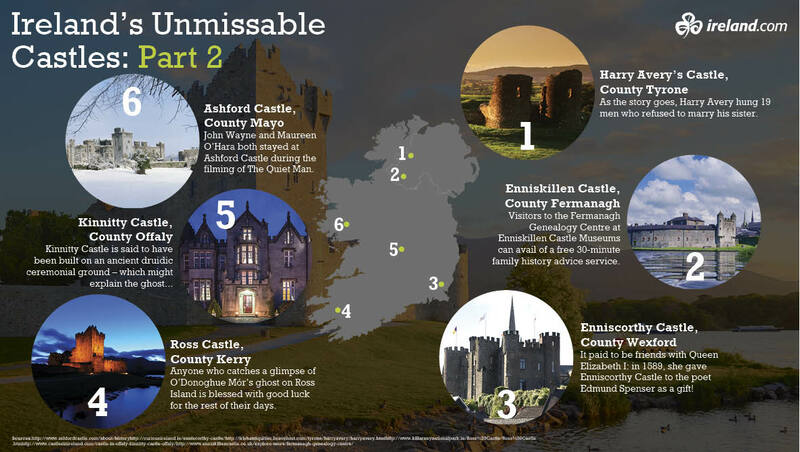 In part two of our series exploring Ireland’s unmissable castles, we take another tour of the living history on offer to the public. This time around, feuding clans and Bronze Age beauty add mystique to these mesmerising monuments to the past. Harry Avery (Henry Aimbreidh) O’Neill was an over-protective brother, to say the least. As the story goes, O’Neill took such offence at the difficulty his sister encountered in finding a husband that he proceeded to hang 19 men who refused to marry her – right here, on the site of the castle named after him. More of a tower house than a castle, the stout building was once a vital defence in the contested lands between the O'Neill and O'Domhnaill clans. Today, the ruins sit calmly atop unspoiled rolling hills, with the Mourne Valley spread at their feet. The jewel in the crown of Fermanagh’s collection of castles, Enniskillen Castle is a master of reinvention. This turreted behemoth on the banks of the River Erne has proven instrumental in the survival of the town throughout its 600-year lifespan. Today a modern hub of history, architecture and culture, the castle documents everything from the Ulster Plantation in the 17th century to Fermanagh’s unique role in the Second World War, and the story of the Medieval Maguires. As a young girl growing up in 19th century Enniscorthy, little could Eileen Gray have realised the fame that lay before her. One of the most internationally renowned furniture designers and architects of the 20th century, her designs now take pride of place in an exhibition at Enniscorthy Castle itself. Now a museum, the castle has worn many hats in its 800 years, from prison to munitions store and rebel hide-out. A rare treat is the castle roof: one of the few of its type open to the public, it provides uninterrupted views of the surrounding countryside, including the battleground of Vinegar Hill. In this quiet corner of Killarney National Park, Ross Castle’s sprawling history is reluctant to remain in the past. Every seventh year, the benevolent ghost of the castle’s founder, O’Donoghue Mór, rises from the bottom of Lough Leane, and circles Ross Island on his magnificent white horse. The island’s occupation stretches back further still, to 4,000 years ago when it was one of Europe's earliest Bronze Age copper mines. Today, this history can be explored on a mining and nature walking trail. A relaxing rowboat ride across the lake leads to the 15th century Muckross Abbey and the luxury of Muckross House and Gardens. Gazing up at this Disney-esque castle, it’s not difficult to understand why Killarney was voted TripAdvisor’s top destination to visit in Ireland in 2015. Deep in the heart of the Slieve Bloom mountains, Kinnitty Castle is a sight to behold. A masterpiece of Gothic revival architecture, it was the 18th century home of Charles Óg O’Carroll, one of the signatories of the American Declaration of Independence. The site of much political turbulence over the centuries – the Castle was first built in 1209 and repeatedly destroyed – its expansive grounds, Augustinian abbey and intimate courtyard today host more wedding guests than revolutionaries. Ashford Castle has been around a long time – since 1228, in fact – so it stands to reason that its 820 windows have hidden many a story. Even the staff don’t know all Ashford’s secrets: some rooms of the castle remained unexplored even up until renovations two years ago. Loved for its luxury as much as for the pretty surrounds of Cong, Ashford has welcomed some very famous faces in its time. 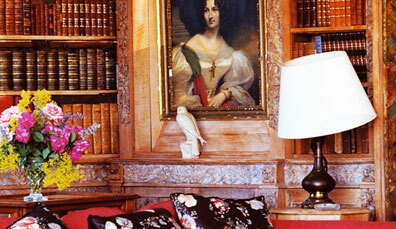 Once owned by the Guinness family, a visit could have you tracing the footsteps of anyone from Oscar Wilde (who spent much of his childhood on an adjoining estate), to John Lennon, Brad Pitt or Princess Grace. 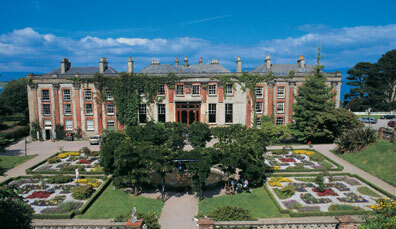 Visit seven of Ireland's biggest and best. 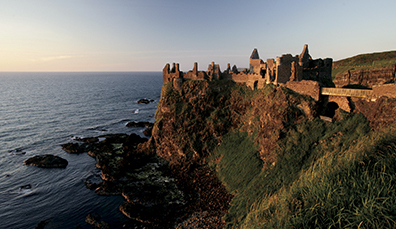 Pirate queens and Narnia dreams fill more of Ireland's castles. Play heir to the estate in these inhabited castles.